If you feel that you've hit a wall with your flexible hour's job search it's time to decide what the best way of working will be for you. Take a look at what's on offer and then start your search again but this time with the information you need to start your dream career. The literal definition of a franchise in the UK is "the right to sell a company's products in a particular area using the company's name." But it's so much more than that. "Franchising is a method for expanding a business and distributing goods and services through a licensing relationship. In franchising, franchisors (a person or company that grants the license to a third party for the conducting of a business under their marks) not only specify the products and services that will be offered by the franchisees (a person or company who is granted the license to do business under the trademark and trade name by the franchisor), but also provide them with an operating system, brand and support." Buying a franchise is a way of taking advantage of the success of an established business. As the 'franchisee', you buy a licence to use the name, products and services of the 'franchisor'. This normally covers a particular geographical area and runs for a limited time, after which it should be renewable as long as you meet the terms of the franchise agreement. Franchise opportunities in the UK are vast, most offering a flexible way to work where you set your own hours. The level of support that the franchisee receives in a franchise relationship is also often exceptional. The franchisor will offer training, support, expertise and experience. A franchisee often pays a percentage of turnover to the franchisor, which reduces your overall profits but you'll have your own business and manage it the way you want to, providing automation and stimulation, giving you a career you can really enjoy! You can find a selection of Franchise Opportunities here. There's also advice on financing a Franchise here and a handy tool on whichfranchise.com to see how much you can borrow. Licensees lease the rights to a brand for incorporation into their merchandise but do not share ownership in it. Having access to major national and global brands, and the logos and trademarks associated with those brands gives the licensee significant benefits. The most important of these is the marketing power the brand brings to the licensee’s products. How does this differ from buying a Franchise? There's no training, no support but on the plus side, there's no restrictions or controls that a Franchisor might expect. Some brands offer a Franchise or a License depending on your business needs. So take a look at license/franchises on offer here. You can also access a comprehensive list of licensing agents, licensors and licensees via LIMA’s online directory. As a self-employed worker, you can, of course, set your own hours and work when you see fit. You could look at going it completely alone a self-employed worker, however, there's a wide range of businesses that offer an existing business model and take job seekers on as consultants or representatives in order to sell their products. If you'd like inspiration on self-employed opportunities click here. Or maybe take a look at what the world of direct selling might offer you. Self Employed and Living in Northern Ireland or Scotland? We're only human after all, so we get sick. People without an employer, such as the self-employed, don’t qualify for Statutory Sick Pay but may be able to claim Employment and Support Allowance instead. More and more employers are offering flexible work. In a flexible working arrangement, an employee has some say over how, where or when they work. Whether this involves working from home, working part-time, job sharing or having flexible start and finish times. Workers benefit from an element of freedom to define a working arrangement that supports their lifestyle. All employees have the legal right to request flexible working - not just parents and carers. This is known as ‘making a statutory application’. Employees must have worked for the same employer for at least 26 weeks to be eligible. 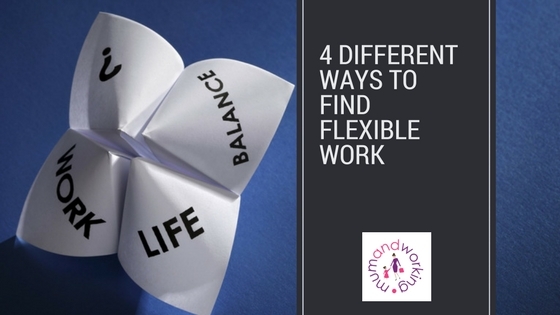 You can find employers offering flexible working jobs here.